What’s a weekend of camping without a camping stove? It makes the difference between eating your catch of the day for supper or flipping a coin to see who ends up running into the nearest town for take-out. 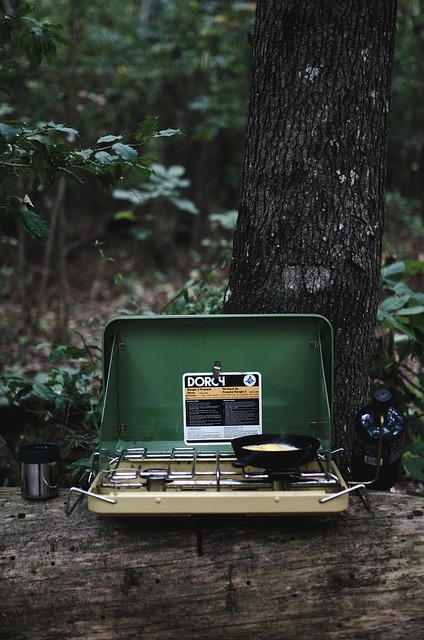 Plus, with a camping stove as part of your camping arsenal, you can avoid the headache of stoking a campfire first thing in the morning to prepare coffee. That is unless you like hunting around the campsite for the driest piece of wood in one of those unpredictable ‘sudden’ downpours. The deal with camping stoves is that there is no such thing as one-size-fits-all. It just doesn’t work that way. There are two reasons for that. One, we humans are programmed to have choices that range from medium to big to really big. Second, we are talking about a source of fire more so than a source of heat. Well, okay, there’s heat involved, but your primary goal with a camping stove is to cook with it. It isn’t much use to you as a heater in the corner of your tent. By the way, don’t ever use a camping stove in that manner, okay? We were just trying to make a point. There are five main types of camping stoves. In this article, we will introduce you to each of them and try to offer some kind of gauge on what makes each one good or bad, depending on your specific needs. So, let’s keep the wieners on ice for just a few more minutes, shall we? Hey, if you are a bit on the lazy side when camping, this is a pretty good choice. All you do is screw your fuel tank to the stove, and you are ready for some just about instant cooking. They also score high points on being compact and easy enough to use that you don’t need a booklet of instructions to figure out what to do. Add to this that a canister stove is lightweight and produces heat quickly, and you’ll be the campsite hero will water boiling in record time. But there are some downsides to the handy, dandy little canister stove. For example, they only use one type of fuel. You need a compatible isobutene fuel canister. Sure, you can find those almost anywhere in the city, but when you are miles away from civilization and have one supply store as an option, the chances are high that the one fuel type they don’t carry with being the one you need for the canister stove. Plus, canister fuel is not the cheapest out there, either. Let’s suppose you have the entire Boy Scout troop out in the woods with you or you are camping with a few other families. A liquid fuel camping stove is your best friend in this situation. Sure, they will take up a lot more space because of their size, and they are also heavier as well. If you are backpacking, those points may be a concern. If you are arriving in a convoy of expensive camping vehicles, you’ll be able to stow one of these away without much trouble. In addition to using a cheaper um, affordable, fuel type, you’ll be able to spark up the stove in all kinds of weather. Some will operate with different types of liquid fuel which opens the options of availability in remote locations. As for negatives, besides size and weight, a liquid fuel camping stove is far more complicated to operate and will eat up valuable fishing time. Plus, once you get it to heat, someone has to watch over it and monitor cooking. Yup, the word ‘alcohol’ did get our attention. However, in camping stoves, this is probably the most popular style in the market and out in the wilderness. There are many benefits to an alcohol burning camping stove, and they include being lightweight and cheap. That’s right, they are very easy on the wallet and your back. Plus, the alcohol fuel required is extremely easy to locate in any camping situation. The rustic fishing lodge on the side of the lake will even have it. However, as awesome as this type of camping stove is, there are a few issues that may be deal breakers on your next camping trip. These babies are freakin slow to heat up. This means if you are hoping for a hot cup of something to warm up on a chilly morning, it’s best to rely on your camping buddy for body heat. You’ll also have to shelter this type of stove as wind and cold are not going to help you much. Oh, and the alcohol fuel supply tends to burn quickly. Well, there is a lot to be said about a wood burning camping stove. At the top of the list is the fact that with one, you don’t have to haul fuel with you. In fact, if you camp in the right areas, you should be surrounded by wood that you can chop up and use for your stove. That means, don’t forget the tools you’ll need to harvest that wood. Sticks are mostly all you’ll need, and oddly enough, it is a lot better for the planet to do this than burn other types of fuel. The downside to wood burning stoves is that someone has to be gathering fuel regularly. That’s a good job for the exchange student who has joined your camping party. If it has been raining, your primary fuel source is going to be wet, and that doesn’t light very well. If you are camping during a fire ban, this stove will end up being a paperweight or footstool and if you are in no particular hurry to eat, the painfully slow cooking time will be fine…maybe. These are pretty handy little units for a number of reasons. Not only are they lightweight, they are compact, cost-effective for those of you who pay attention to such things and…the best thing is, but they are also easy to use. The solid fuel is a fuel tab that you light, toss into the stove and then you are on your way. If that sounds far too easy well, it is. So even if you are not a seasoned camper, you’ll find this type of cooking stove to be very useful on your outdoor adventure. Then there’s the other side of the coin. While the fuel tabs are easy to use and transport, they are not cheap. Plus, they are not as available as many of the other fuel types out there so be prepared and pack a bunch just in case. If you are sensitive to certain scents, you won’t like the way the fuel tabs smell and keeping a fire burning in wind and rain will be a challenge. Did we mention that you won’t be able to control the size of the flame, either? Yeah, that’s right. Did We Forget To Mention Anything Else About Camping Stoves? Well, yes, we did. Before you head out to your local outdoor supply store, think a bit about the type of camping you do. This will help you to narrow down the exact type of camping stove that is the best fit for your needs. It’s also not unusual to own more than one type of stove to meet the needs of your different camping styles. That’s because some stoves are best for individual use and others are not. It really does come down to how you intend to use the stove. Another key factor is fuel availability. As stated above in the ‘cons’ section of more than one type of camping stove, you may find securing the fuel you’ll need to be a challenge far greater than catching dinner. If ease of use to you means being able to spark up the stove whenever you need it, you will have to either carry additional fuel or opt for a stove that requires little fuel or fuel that is readily available regardless of what mountainside you are perched on. Although we only broke down the world of camping stoves by type on this list, there are several different stoves under each of those categories. Different manufacturers have created different stoves. So, when you have narrowed down your choice to the type of stove you need, use that to search online for details on the specific stoves in that category. Getting the right fit takes time but it will be worth it on those chilly mornings you wake up at the campsite with a hot pot of coffee waiting for you and the smell of breakfast sizzling to start you on your way. It’ll beat trying to rub two sticks together in a windstorm just to get motivated.